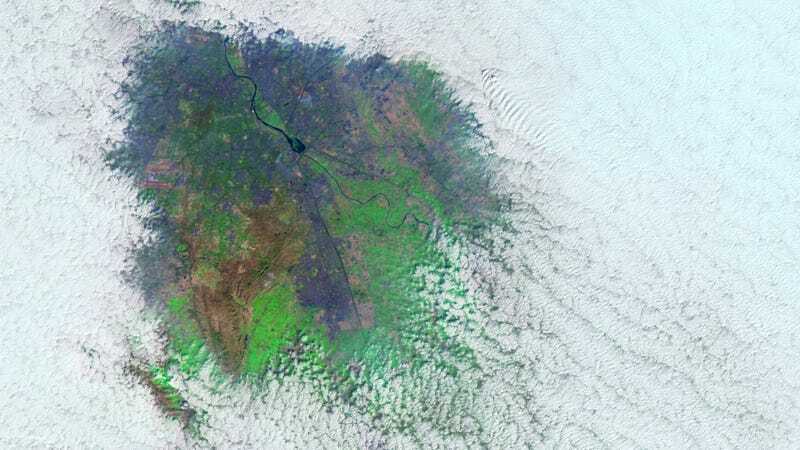 Since at least 2014, satellites have been showing odd holes in the fog over Indian cities. Scientists didn’t know why until they published a paper about it earlier this year in Geophysical Research Letters. As it turned out, the fog resulted from aerosol pollution in these cities, but cities also emit warmth, which reduces the humidity the fog needs to stay. This cycle creates fog holes that pop up over urban centers—in China, Europe, and the United States, too. This urban heat island effect might be helping Indian cities decrease their fog in small patches, but it’s not exactly a good thing. Cities are concrete jungles that concentrate heat. This additional heat leads to an increase in energy demand and the risk of heat-related illnesses. Fog holes over northern India on January 30, 2014. The largest Indian fog holes pop up over New Delhi, which is dealing with severe air pollution. The pollution got so bad last year that Chief Minister of Delhi Arvind Kejriwal even called the region a “gas chamber.” Some experts have recommended oxygen tanks as a way to protect residents’ health. These holes are the latest sign of the country’s dangerous pollution, which Indian officials are now trying to address through a $230 million plan to reduce the crop burning that drives much of the air pollution. Though the country should spend something more along the lines of $600 million, this is a start. Right? In the meantime, we can take in the beautiful satellite imagery that tells us a chilling story. “I am still as awestruck as when I first noticed this phenomenon over northern India during my Ph.D. research in the mid-2000s,” said Gautam. Fog holes over northern India in 2016.